House W, written by Maarten (2010.03.21). "This is House W, located somewhere in China. Just two open boxes and a stair case connecting them. And don't you just love that tiny little tree in the back? 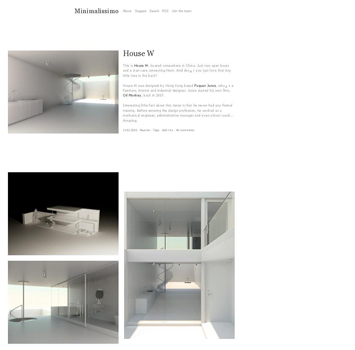 House W was designed by Hong Kong based Fuquan Junze, who's a furniture, interior and industrial designer. Junze started his own firm, Oil Monkey, back in 2007. Interesting little fact about this Junze is that he never had any formal training. Before entering the design profession, he worked as a mechanical engineer, administrative manager and even school coach… Amazing."